It is 9:52 p.m. in Fort Lauderdale at my home near I-95 and State Road 84/Marina Mile. We are experiencing bands of heavy rain, wind gusts recorded to 60 mph and intermittent tornado warnings. The TV satellite service is intermittent and power went out for a minute. TV reports are that more than 80,000 people are without power in Miami-Dade County and more than 20,000 in Broward County. Friends near the Triton office, close to US 1 and 17th St. in Fort Lauderdale, have lost electrical power. Friends in Dania Beach at Derecktor have lost cell service. Food safety link from U.S. government. How to use a C battery as a D battery. Click for Hurricanes Irma and Jose updates. 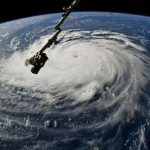 Click for weather.com hurricane updates. Hurricane Jose is following Hurricane Irma as an “extremely dangerous” Category 4 storm with maximum sustained winds near 150 mph, according to the National Hurricane Center. Hurricane Jose was about 335 miles east-southeast of the Northern Leeward Islands at 5 p.m. ET , moving west-northwest at 17 mph, the National Hurricane Center said. Hurricane Irma has left damage and death through many islands in the Caribbean and most recently hit parts of Cuba and the central Bahamas. Several forecasts predict the storm will strengthen back into a Category 5 storm on its way to the Florida Keys. Click for details from weather.com. 90 percent of government buildings and business structures suffered damage. The airport runway and most roads leading to the airport have been cleared of debris and British troops supported refurbishment of two shelters damaged during the hurricane. Four (4) confirmed dead and the NEOC was destroyed and temporarily relocated to the 911 Centre. The airport is operational but the tower has been compromised. Needs reported: Support with communications especially to reconnect persons with families to let them know they are safe, emergency relief supplies: food, cots tarpaulins, water; infrastructure for electricity and water and security is critical need due to instances of looting. Click for photos of Hurricane Irma damage throughout the Caribbean. Port Everglades is closed to inbound ships and all ocean-going commercial vessels have departed the port except one tug and barge authorized by the Coast Guard to remain in port. Given the current storm track, the USCG Captain of the Port projects setting Port Condition ZULU at 8 p.m., Friday, Sept. 8 with gale force winds expected within 12 hours. U.S. Coast Guard damage assessment of St. Thomas after Hurricane Irma. HD Video by Petty Officer 1st Class Luke Clayton. Click to visit Storm Carib. “We are all staying prepared, so there won’t be much from us until next week,” Sebastian wrote. The Antigua Charter Yacht Show resumed business activity and registration today for the upcoming show in December. The U.S. Coast Guard Captain of the Port has notified Port Everglades that Hurricane Port Condition X-RAY has been set for Hurricane Irma as of noon today, Sept. 7, with the expected onset of gale force winds (39 – 54 mph) within 48 hours. Given the current storm track, the USCG Captain of the Port projects setting of the following conditions at the times noted: YANKEE at 8 a.m, Friday, Sept. 8 and ZULU at 8 p.m, Friday, Sept. 8. Twelve (12) persons utilized the four (4) shelters that were opened. Each shelter received various levels of damage and are currently closed. Airport currently open for emergency landings, and VC Bird International Airport expected to reopen for commercial flights on Thursday, Sept. 7. Barbuda had experienced winds of 119 mph with gusts of 150 mph. Contact was lost with Barbuda just after 1 a.m.. Note: Barbuda took down the antennae for radio communications as a mitigation measure and is expected to re-establish it after the winds have abated and hence a better idea of damage can be communicated. Reports of major roof damage, damaged utility poles and uprooted trees. 100 persons housed in nine shelters and reports of damage to the roof of one shelter. The island experienced some rains, gusty winds and experienced flash flooding in the south of the island on Tuesday, Sept. 5. No fatalities have been reported. The island experienced some wind and rain, with no reports of damage to date. Main power was shut off as a precautionary measure. No reports of deaths/missing persons at this time. Damage to homes in areas such as Conaree, Molineaux and St.Paul’s Keys. Downed poles and trees, and disruption of electricity supply. Power is out and several persons had to be evacuated due to roofs of homes being blown off. For additional information and updates on port conditions, visit the USCG Homeport website at: http://homeport.uscg.mil/miami. Vessels are advised not to go up the river if they do not have a destination. Megan Lagasse is general manager of Bahia Mar Marina in Fort Lauderdale, which is under mandatory evacuation orders by the county. “No one can stay on the beachside, everyone is supposed to evacuate,” Lagasse said by phone this afternoon. 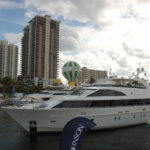 Many of the larger yachts that are still in the marina are leaving, she said. Click for Fort Lauderdale Chamber of Commerce information and links. Hurricane Irma crossed the northern Caribbean islands this morning and is on a course to cross the British Virgin Islands and northern Puerto Rico this afternoon. Currently the maximum sustained winds are at 185 m.p.h. on the Saffir-Simpson Hurricane Wind Scale which makes the storm one of the strongest on record in the Atlantic Ocean. Reports are coming in from the smaller islands impacted. The Prime Minister of Antigua and Barbuda, the Honorable Gaston Browne issued a preliminary statement this morning after Hurricane Irma passed over the area. He said there has been no reported loss of life and that the airport will be open for flights into and out of Antigua by 2 p.m. today. He reported that property damage, “is not anywhere near the horrendous injury that was feared,” and that the island’s main infrastructure “has stood-up and our country can resume normal life within hours”. The report stated that the Antigua and Barbuda Defence Force is at work clearing fallen trees and debris. Fort Lauderdale and Broward county, Florida expect storm conditions to begin Friday evening. The mayor of the county issued a local state of emergency to begin noon Tomorrow (Thursday) for coastal areas east of Federal Highway (US 1) and barrier islands. This impacts Bahia Mar Marina, Pier 66 Marina, Sunrise Harbor Marina, Las Olas Marina and other marinas and businesses near the Port Everglades area. The Category 5 storm exceeds the base wind on the scale describes of winds more than 157 m.p.h. Category 5 storms predict: Catastrophic damage will occur: A high percentage of framed homes will be destroyed, with total roof failure and wall collapse. Fallen trees and power poles will isolate residential areas. Power outages will last for weeks to possibly months. Most of the area will be uninhabitable for weeks or months. CNN is reporting that four of the strongest buildings on the French side of St. Martin have been destroyed. The strongest storm in the Atlantic Basin in 10 years is heading for the Leeward Islands in the Caribbean.Hurricane Irma, a category 5 storm, is expected to pass near or over Antigua, the US Virgin Islands and Puerto Rico tonight or tomorrow morning. Irma has maximum sustained winds of 175 m.p.h. The exact path of the hurricane is unknown and dependant upon several weather patterns. The storm could head toward the U.S. Atlantic coast, Florida or the Gulf of Mexico toward the end of this week. Update on Aug. 5 from Miami Herald.